This assertion was followed by short supportive quotations beneath a rogues gallery of Israel’s security establishment: three rows of pictures, the top one of Six former Israeli IDF Chiefs of Staff, in the middle five former Shin Bet heads (internal security agency), and on the bottom five former heads of the Mossad (international intelligence agency). To be sure this is an imposing array of top Israeli officials together indirectly expressing their collective dismay with respect to the Likud government led by Netanyahu turning its back on the two-state solution. As such, it is an impressive expression of Israeli elite and informed opinion, but whether it reflects a consensus with political leverage either here in the United States or in Israel seems doubtful. 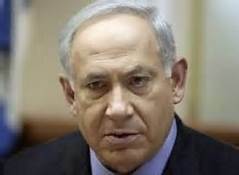 At minimum it conveys the strong impression that an influential part of the Israeli establishment has lost confidence in the Netanyahu leadership to protect Israel’s vital interests, and this is itself significant. 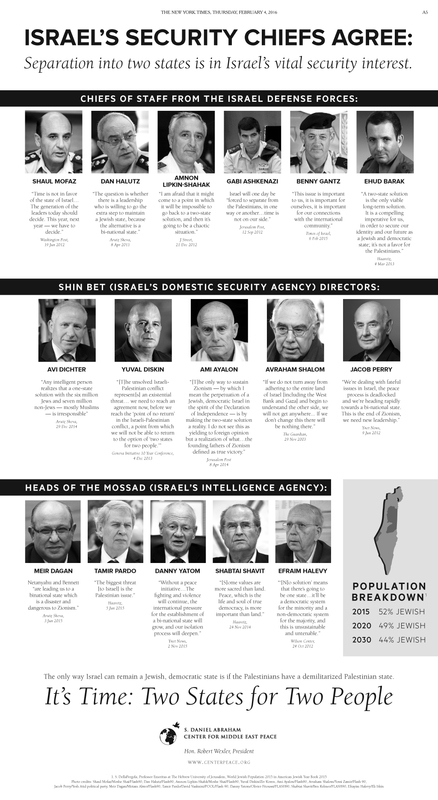 The ad consists of two main features: photos of these military and intelligence officials, many familiar and some notorious names to those following Israeli politics and one-line quotations from each one expressing the need and urgency of implementing some version of the two-state solution for the sake of Israel’s security. Not surprisingly, all 16 are men who have been during the careers instrumental in the dispossession and oppression of the Palestinian people. Also not surprisingly, the ad makes clear that this break with the Netanyahu approach has nothing whatsoever to with seeking deferred justice for the Palestinians or some kind of empathy for their long ordeal. Support for a Palestinian state is exclusively connected with the supposed need to defuse the so-called ‘demographic bomb.’ Or in the language of the ad, “The only way Israel can remain a Jewish, democratic state is if the Palestinians have a demilitarized Palestinian state.” This rationale is the prelude to positing a conclusion in bold type and enlarged format: “It’s Time: Two States for Two People[s].” And to remove any doubt there is a sidebar summarizing the demographics: 2015 52% Jewish, 2020 49% Jewish, 2030 44% Jewish. I find this anti-Likud rejection of the current drift toward an Israeli one-state outcome noteworthy for two different reasons: first of all, it proposes a solution that will not work; not only is there no mention of the need to give up the settlements or to address the rights of Palestinian refugees, but the conception of ‘a demilitarized Palestinian state’ is such an affirmation of the inequality of the two peoples that it is a virtual guaranty that even if the Ramallah leadership turned out to swallow such an arrangement, the Palestinian people would not. The only path to a sustainable peace needs to be based to the extent possible on the equality of the two peoples, and if a Palestinian state is ever acceptably established it must be endowed with the same sovereign rights as Israel. Secondly, it is worth noticing that Netanyahu is far from alone in rejecting the two-state diplomacy. The President of Israel, Reuven Rivlin, elected in 2013 by the Knesset, is an unapologetic proponent of the one-state approach, endorsing the biblical and ethnic claim to the whole of the West Bank, the maximal territorial version of Greater Israel. Similarly, Israel’s ambassador to the UN, Danny Danon, is a settler firebrand and government official who has long spearheaded opposition to any politically viable accommodation with the Palestinians that acknowledges their right of self-determination. Against such a background, it seems obvious that any revival of the two-state diplomacy along the lines proposed in the ad, let’s say at the initiative of the next American president, would soon reach a dead end. There is no doubt that resorting to such an ad in the leading American newspaper is convincing evidence of a deep split in Israeli leadership circles, but its proposed alternative approach fails to move prospects for a just peace forward. It suggests a split between those Israelis worried about ruling over a Palestinian majority population and those Israelis guided by territorial and colonizing ambition. Neither orientation is located on a path leading to sustainable peace. Only a solution and vision based on the equality of Jews and Palestinians deserves respect and engenders hope. Let’s not be further misled, this weighty statement by Israel’s security establishment should not be confused with a revival of the Israeli peace movement or some expression of civil society disaffection directed at the Netanyahu leadership. It is, at most, lending transparency to a long ongoing conversation within Israel’s governing elite, nothing more, nothing less. Furthermore, the idea of safeguarding Israel’s democratic character seems to presuppose that Israel remains a democracy. Yes, as with other apartheid structures, it is ‘democratic’ but for Jews only. For Palestinians, whether living as a minority in Israel, under occupation in the West Bank and East Jerusalem, subject to captivity and collective punishment in Gaza, and in refugee camps scattered within the occupied territories and neighboring countries, the label ‘democracy’ has long been a cruel joke. To qualify as an authentic democracy rights based on non-discrimination must be upheld for all those living under the authority of the governing process. The S. Daniel Abraham Center for Middle East Peace makes no secret of its Zionist leanings and Israeli outlook, although it seems genuinely to believe that Likud governance of the country is endangering Israel’s identity as well as its security. Its webpage proclaims a commitment to peace, honors the memory of Yitzhak Rabin, and calls favorable attention to the Arab Peace Initiative of 2002. At the same time it refrains from criticizing Israel’s treatment of the Palestinian people or any of the numerous daily denials of Palestinian rights, avoids mentioning Israel’s apartheid governance structures, and refrains from expressions of empathy for the multiple forms of suffering imposed upon the Palestinian people.